A4 / 316L (EN 1.4404) is an austenitic chromium-nickel stainless steel containing molybdenum. This stainless steel also has extra low carbon content in order to reduce the risk of chromium-carbide precipitation. EN 1.4404 is one of the most commonly used stainless steel grades and Nord-Lock washers made of EN 1.4404 are suitable for most applications where no chlorides or acids are present. 254 SMO® is a high performance austenitic stainless steel (according to EN 1.4547) with greater mechanical strength and resistance against corrosion than most austenitic Stainless Steel grades. The material is resilient against pitting and crevice corrosion due to high contents of chromium, nickel, molybdenum and nitrogen. 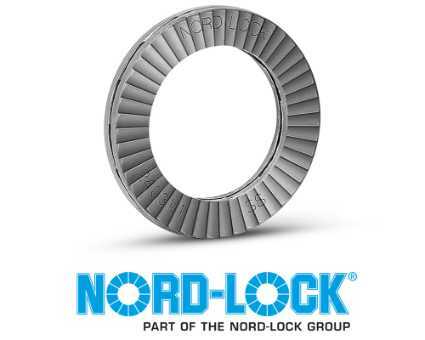 Nord-Lock 254 SMO® washers are specially designed for chloride rich processes and salt water solutions / atmospheres, i.e. environments where stainless steel washers made of EN 1.4404 are not suitable.